Amitai Etzioni has devoted a lifetime of study to the question of what makes a good society, and his work as the founder of the communitarian movement attests to his influence in moving the public debate away from a preoccupation with rights to a balance between individual rights and social responsibilities. In this landmark new book, he invites us to examine how a communitarian society should operate in practice and what values we must bring to our social interactions if we are to achieve stronger and more enduring community ties. The New Golden Rule takes its title from the familiar adage to "do unto others as you would have them do unto you". But when taken to a society-wide level, the Golden Rule's admonition expands, taking the formulation "respect and uphold society's moral order as you would have society respect and uphold your autonomy to live a full life". The problem facing society today is that many of us are wary of morality and order while others are suspicious of liberty - which in their mind is equated with permissiveness. In an analysis that powerfully cuts this Gordian knot, Etzioni lays out how we can and must have both order and autonomy if we are to create an environment in which individuals and neighborhoods can thrive. Recognizing that excessive morality and excessive liberty are each a dire threat to the health of a society, Etzioni shows that we have overreacted in recent years by assuming that there must also be a tradeoff between morality and freedom. That need not be the case, he argues, because when order is largely based on moral commitments rather than on the law, and autonomy is regarded as a place in a social space, these two social virtues can reinforceeach other. Using this framework, Etzioni studies the implications for the future of community in America and explores the policy implications for governments, community groups, and families. "Like other eminent social theorists of the past, Amitai Etzioni addresses at once timely practical questions and timeless philosophical dilemmas. Scholars and citizens alike will be better off for having grappled with his argument, for as Etzioni argues, we all must learn to reconcile the contrasting claims of autonomy and community." 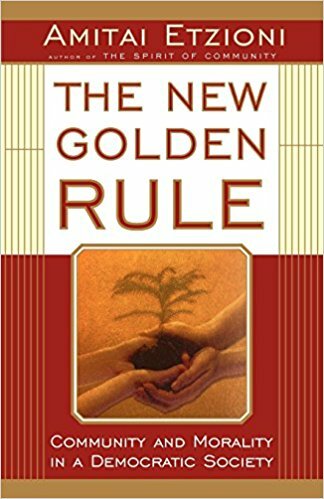 "In The New Golden Rule, Amitai Etzioni argues that we must move beyond the current trendy concern with civil society to a substantive understanding of those core values that can bind us together as a community. This book is a serious effort to map out a strategy for 'remoralizing' contemporary societies without abandoning their basic liberal framework, written in a manner accessible to anyone interested in the 'sociology of virtue.' "